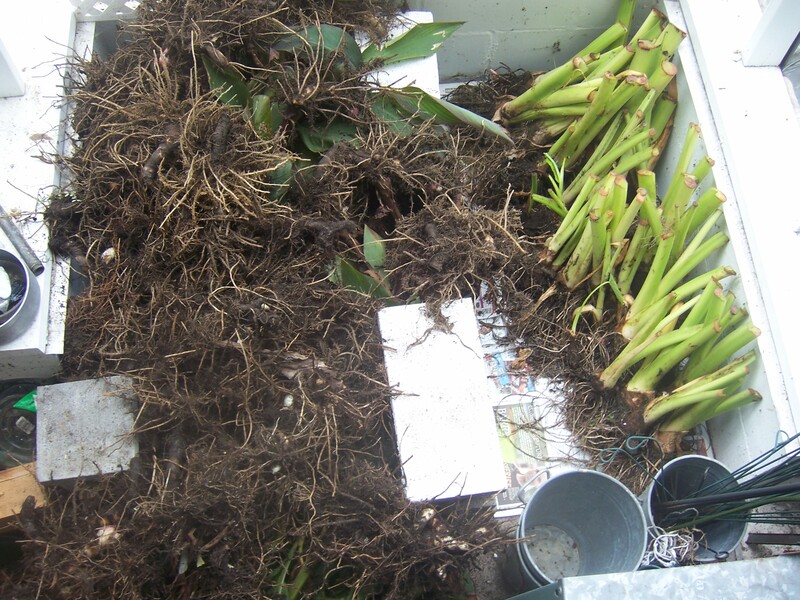 This is the end result of a day spent digging and removing Elephant Ears and Canna from the garden, and preparing them for their long winter’s nap. It’s probably my least favorite day in the garden, and each year, I dread its arrival. The chill in the air is my signal that, “It’s time.” Armed with a pitchfork, clippers, and nerves of steel, I apologetically approach each plant. I want to say, “Believe me, this is going to hurt me a lot more than it hurts you.” I want the plants to understand that my actions are for their own good, so that they may live to see another summer. But in the end, I fear that they’ll see me as a Viking, pillaging and ransacking their cozy beds. Gardeners, I think, must have a bit of masochism in their blood. Who else would try to trick Mother Nature by planting wrong-zone plants, nurturing them into blooms, and then hacking them down, ripping them from the ground, and storing them over the winter — only to start the process all over again in the spring? Oh, to be content with zone-appropriate material! As I went about my task, though, I found my mind wandering. With each cut and pull, I went from a man on a mission of mercy to Hannibal Lecter. Maybe it was the large number of plants or the rush of outdoor adrenaline, but my pace certainly increased and I adopted a take-no-prisoners, scorched-Earth policy. The plants were barely out of the ground, and I was planning on new locations for next season. If one of the Canna had an unopened bloom, I said, “Too late. You should have thought about flowering a few weeks ago.” And then it occurred to me, with dastardly delight, that I could totally milk three blog posts out of this massacre. In the end, like a barbarian counting his loot, I surveyed my day’s work. Elephant Ears on the right. Canna on the left. Overwhelming? A little. Exhausting? Absolutely. Ruthless? Drastic times call for drastic measures. . . Gardening. It’s a dirty job, but someone’s got to do it. By the way, as for those posts — be sure to check back for step-by-step instructions on digging and storing these tender plants. Yes, it is sometimes a bit sad what we do to plants. I’m learning not to plant outside my zone (most of the time!). And I do feel a bit responsible when a plant dies. But they never know if their home is permanent or if they’ll be moving soon! I am guilty of letting my imagination get the best of me, often giving my plants human emotions. It just adds another layer to the gardening experience — as well as a few laughs! Don’t let the work scare you away from Elephant Ears! They’re practically indestructible — cold is about the only thing that will do them in. Besides, the fun quotient far outweighs the work factor. this will make you jealous..we can just leave ’em in here, and get on with having fun. Ok we do prune cannas gently, but ruthlessly, but that’s all. Brisbane, Australia, yep we are so lazy here. There was a great comment on, I think, the post, ‘arguing on the internet’ – “vegetarians don’t love animals they hate plants.’ a little off-topic but your comment on pillaging reminded me of that. I really enjoy your blog, hilarious! There’s another one you might like, that’s the one where he finds flowers that resemble footbal teams…”Horticultural Tailgating” was one post..so funny.